A swollen finger is not an uncommon condition. 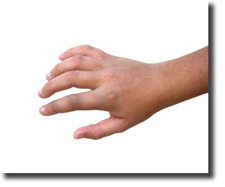 The swelling can be the result of an injury (car door, hammer, broken finger), a bee sting, mosquito bite, or a spider bite. It can be the result of an arthritic condition, or related to a problem centered elsewhere in the body. The most common cause of a swollen finger however is most likely infection. If you believe you know the cause of your swollen finger, and the condition is not too severe, you may choose just to live with it, in the knowledge that the swelling will soon subside. You can soak the finger in cold water, or in an Epsom salt solution, to help lessen the swelling. If the swelling is the result of a sliver, or a bee sting, the first order of business is to remove whatever is stuck under the skin. In doing so you can lessen the extent of the swelling and any associated pain. Also, if you have a ring on your swollen finger, you should remove it as quickly as possible. This can be a challenge in some cases, especially where the ring is difficult to remove in more normal circumstances. Infections - Infections to the fingers usually start out small, and if caught right away can be easy to treat. It's important to do this, as if an infection is allowed to grow or spread, it can present greater difficulties, including more pain and swelling, and can conceivably grow into something quite serious. The most common type of a finger infection is called Cellulitis. This is usually a superficial infection, and while a swollen finger may result, the swelling is usually not that great (still, get that ring off!). Other types of infection which may cause swelling are Herpetic whitlow, affecting mainly the fingertips, Felon, also affecting the fingertips, Deep Space infections, in which the webbing between the fingers is affected, and Flexor tenosynovitis, in which the entire finger is apt to swell. All of these conditions, if persisting, should be brought to the attention of your doctor to avoid serious complications from arising, and also to keep your own discomfort to a minimum. Arthritis Can Cause A Swollen Finger - Arthritis in the hand and fingers can also be the cause behind swelling. A swollen finger, or thumb, is fairly common when arthritis is present, as arthritis is a disease that causes wearing away of the joints. Joints are where bones meet, and since your hand has 27 bones, there are plenty of places, including the joints in your fingers, where arthritis can wreak havoc. There are two kinds of arthritis, osteoarthritis, which is a degenerative joint disease, and rheumatoid arthritis, in which the lining of the joints can become inflamed, causing pain and swelling in the process. Several Ways To Remove A Ring - As was mentioned earlier, if you have a swollen finger, or appear to be on the way to getting one, it's extremely important to remove a ring which is on that finger as soon as possible. If not, it can become quite a painful ordeal, and the ring may eventually have to be cut off. Whenever you go into surgery in a hospital, one of the usual procedures is to remove any rings from your fingers, as the anesthetic, or another part of the surgical procedure, can sometimes cause your fingers to swell. If you're wearing a wedding ring that hasn't been removed in a few years, it can be quite an ordeal, for all involved including the ring wearer. Soap and water is usually the initial approach, and generally works. The secret is to work soap under the ring and then try to twist the ring off. It may take several attempts, and in some cases may not work at all. If the finger is at all swollen, dipping it for a minute or two in ice water can also help. One recommendation is to use Windex instead of soap as the lubricant. Dental Floss To The Rescue - Still another approach, which sounds like something out of an engineering textbook, is to wrap dental floss around your finger on the side of the ring nearest your palm. Wrap the floss tightly, one turn at a time, with the floss being wound tight up against the edge of the ring with each turn. As you wrap more and more floss, it will slowly push the ring towards your knuckle, and eventually over that joint. When the ring passes over the joint, you can then easily pull it off. While you're congratulating yourself for getting the ring off your swollen finger, don't forget to unwrap the floss, or you may end up with another problem. In summary, if you have a swollen finger and it appears to be getting worse, see a doctor, especially if you think there may be an infection involved. Remove any foreign matter such as a sliver, or stinger, to keep the pain and swelling to a minimum. And, it's very important to remove a ring from the affected finger as soon as possible.